Martin St. Louis faces off against his former team, a place where he accomplished so much, as they stand between him and a return trip to the Stanley Cup Finals. Photo courtesy of MSG Photos. The Rangers and the Lightning are meeting for the first time in five and a half months, as well as the first time ever in the Stanley Cup Playoffs as both teams battle for a chance to play in the Stanley Cup Final. The Rangers are looking to make it back to the finals for the second straight year, while the Lightning are in the Eastern Conference Final for the first time since 2011. The connections between these two teams are well documented, especially following the captain for captain trade last season involving Ryan Callahan and Martin St. Louis. Anton Stralman and Brian Boyle both played on the Rangers last season, and Dan Boyle and Dominic Moore were both key members of the Lightning at one point. The emotions were high when the two teams first met, including Ryan Callahan’s return to the Garden and St. Louis’ return to Tampa Bay. But the friendships are behind all of the players, with St. Louis putting it best again. In a span of two weeks in the regular season, the Lightning beat the Rangers in three games, outscoring them by a final score of 15-7. But it’s fair to say that the Rangers turned the page after they played Tampa Bay. After losing to Tampa and Detroit in back-to-back games, the Rangers finished the season on a 42-12-3 run. Everything from the regular season is thrown out of the window when it comes to the playoffs. Both the Rangers and the Lightning are very fast teams, and this is as even of a series as there could be in the Conference Finals. It’s the best of the best remaining. As far as health goes, Mats Zuccarello has started working out, but will not play in Game 1. It is unknown if he can return in this series, but don’t rule it out. Dan Boyle was on the ice for practice yesterday after taking a vicious hit from Bruce Orpik in Game 7, and Tanner Glass did not practice yesterday, but it was just a maintenance day for him. 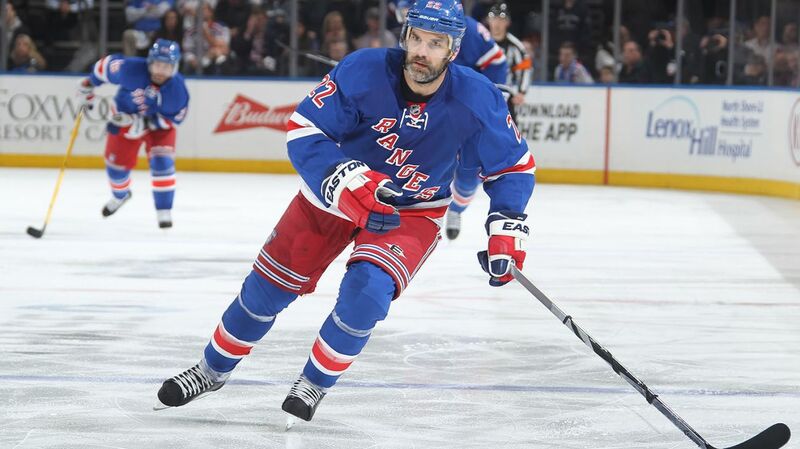 Dan Boyle was back on the ice for practice on Friday, and should dress for Game 1. Photo courtesy of MSG Photos. Ben Bishop has been pretty successful in his first ever Stanley Cup Playoffs, posting an 8-5 record with a 1.81 GAA and a .931 save percentage. He’s been shaky at times, prone to some gaffes, but for the most part he has been very solid, and he just outdueled Carey Price of the Canadiens. So his confidence is at an all-time high. Adding to that confidence is his career success against the Rangers. Bishop has won all eight of his starts against the Rangers, two of them being shutouts, with a 1.46 GAA and a .946 save percentage. The big question is whether or not the 6-foot-7 goalie cam carry that success into the further rounds. The farther the Lightning go, the more pressure there is on an inexperienced playoff team and goalie. Despite all of that, the Rangers are going to be facing another quality goaltender in Bishop. Clearly one of the focal points of the Lightning offense is their captain, Steven Stamkos, a 40 goal scorer in the regular season. Stamkos is a dynamic center with incredible talent and one of the best wrist shots in the entire game. He plays well with Ryan Callahan, who is a game time decision for Saturday, and carries a five game point streak (2-5-7) into today’s game. The Rangers are also going to have to work extremely hard to try and contain “the triplets,” also known as the Lightning’s dynamic line of Tyler Johnson, Nikita Kucherov and Ondrej Palat. The trio has combined for 17 goals and 14 assists in the playoffs, with Johnson leading the team with eight of the goals. The Rangers counter with Henrik Lundqvist, playing arguably the best playoff hockey of his career and coming off of a fantastic Game 7 performance against the Washington Capitals. For the playoffs, Lundqvist has a 1.60 GAA with a .944 save percentage through the first two rounds, leading all goalies in the playoffs. He’s had just one game with a save percentage below .930, has won his last 10 elimination games at MSG, and has allowed more than two goals in a game just twice. 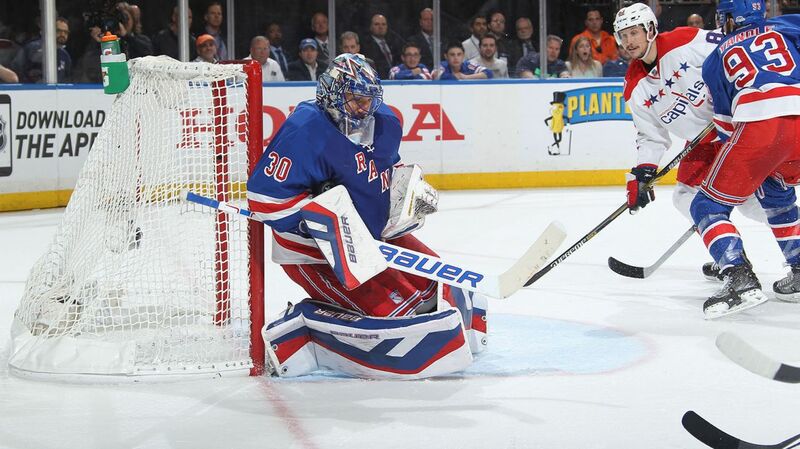 Lundqvist is locked in, and he’ll need to remain at the top of his game in order to stop the best offense in the NHL. Henrik Lundqvist will need to be at his best when the Rangers take on the Lightning, who boast arguably the best offense in the NHL. Photo courtesy of MSG Photos. Martin St. Louis isn’t having the postseason that he’s hoped for. He’s tallied only four points, all assists, and now faces off against his former team for a chance at getting back to the Stanley Cup Finals. He’s in a slump, but it’s hard to imagine him playing bad when so much is on the line, and he’s facing the team where he accomplished so much. St. Louis will be motivated, and will need to be more productive on the top line with Rick Nash ad Derick Brassard. There are two X-factors for the Rangers in this series; Dominic Moore and Jesper Fast. Dominic Moore was bumped up to the third line with Carl Hagelin and Kevin Hayes. Moving Hayes to the wing took some pressure off of the rookie, and Moore’s speed and grit around the net adds a nice element to the line. He didn’t score, but was very close to finding the back of the net, and that line worked very well. With Vigneault shuffling the lines around, Jesper Fast found a new home on the second line with Derek Stepan and Chris Kreider. His speed works well with the line, and he does all of the subtle things that help the line work, like tapping the faceoff back on the winning goal in overtime. Fast has been an excellent addition to what was the best line in the second round. 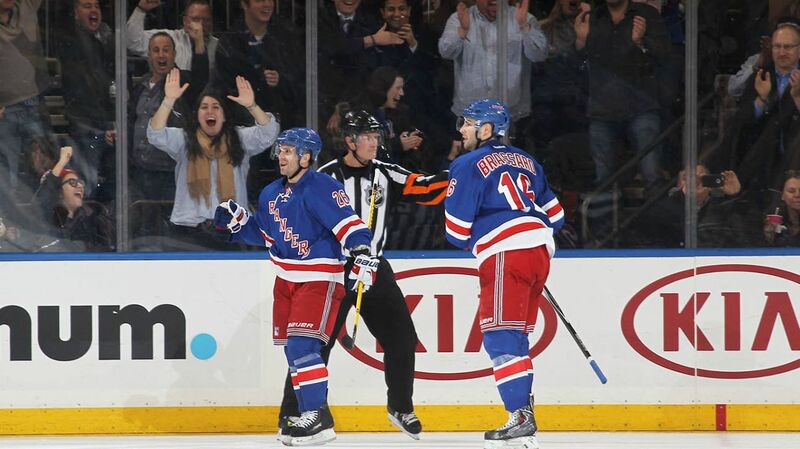 The Rangers and the Lightning will faceoff at Madison Square Garden at 1 PM. The game will be broadcasted on NBC. I will be at the game with my cousin wearing my Derick Brassard heritage jersey. I’m not sure where I’m sitting yet, but I’ll tweet where I am when I get to the game, so follow @The_RangerZone on Twitter. Posted on May 16, 2015, in Game Previews and tagged Alain Vigneault, Ben Bishop, Cam Talbot, Carl Hagelin, Chris Kreider, Dan Boyle, Dan Girardi, Derek Stepan, Derick Brassard, Dominic Moore, Hartford Wolf Pack, Henrik Lundqvist, James Sheppard, Jesper Fast, JT Miller, Keith Yandle, Kevin Hayes, Kevin Klein, King Henrik, Madison Square Garden, Marc Staal, Martin St. Louis, Mats Zuccarello, Matt Hunwick, MSG, MSL, New York Rangers, NHL, NHL 2014-2015 Season, NHL Playoffs, NY Rangers, NYR, Rangers, Rangers Nation, Rangerstown, Rick Nash, Ryan Bourque, Ryan McDonagh, Stanley Cup Playoffs, Steven Stamkos, Tampa Bay Lightning, Tanner Glass, The Ranger Zone, Tyler Johnson. Bookmark the permalink. Leave a comment.